Two headstones at Holy Cross Cemetery in northern California are memorials to John and Bridget Brady, onetime Bostonians who helped give Tom Brady the gift of life. Little did John and Bridget Brady know that their marriage would one day lead to the birth of one of New England’s most revered sports figures. His native land withered by famine, his countrymen dying by the hundreds of thousands, John Brady fled Ireland in the mid-19th century and found work as a laborer in Boston. Soon, he married Bridget Bailey, herself a refugee of Ireland’s Great Famine, and at age 22 they began raising a family. Little did John and Bridget Brady know, as they coped with the hardships of their new lives in a new land, that their marriage one day would help make possible the birth of one of New England’s most revered sports figures. They were the great-great-grandparents of Patriots legend Tom Brady, according to new research into the five-time Super Bowl champion’s roots. Census records show that John and Bridget Brady had two children in Boston, including a son, Philip, who is Tom Brady’s great-grandfather. Philip’s birth certificate is not available, but a registry in the Massachusetts Archives shows that his younger brother, Henry, was born in 1857, in the family’s home on First Street in South Boston. Brady’s Irish ancestry has been no secret. His father, Tom Brady Sr., has previously said his maternal ancestors immigrated from Ireland during the famine. 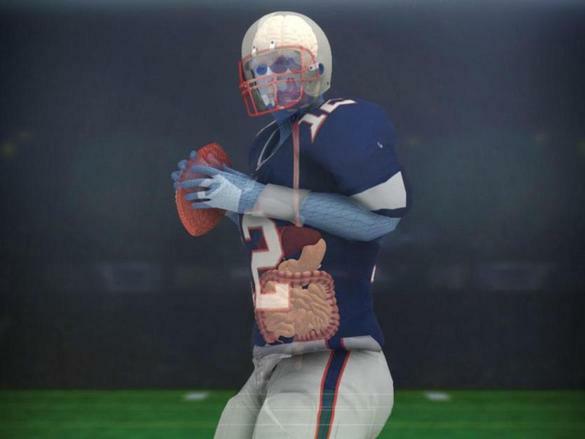 But Jim McNiff, an amateur genealogist who spent months charting the quarterback’s family tree, has helped produce the first public evidence that Brady’s father’s paternal lineage extends deep into the history of Boston, where the Patriots great would gain his fame and fortune and make his home. The research shows Brady’s ancestors include a major league baseball player, a firefighter who responded to San Francisco’s catastrophic 1906 earthquake, a newspaper reporter who was shot to death on the job, a West Point graduate who reportedly became America’s first prisoner of war in World War II, as well as Catholic priests and nuns. It’s a story that spans the nation, one that chronicles both the ordinary and extraordinary lives of the Irish refugees on Brady’s father side and the German-Nordic immigrants of his mother’s family as they followed winding paths to the quarterback’s birthplace on the shores of San Francisco Bay. McNiff is a retired hospital financial manager and college professor who lives in Burlington and has made a pastime of investigating family histories. His work has included producing family trees for WGBH personalities Jim Braude and Margery Eagan and auto magnate Herb Chambers. McNiff based his Brady findings on census reports, birth and death certificates, cemetery plots, municipal employment records, news articles, and original research conducted by other users of ancestry.com. He sent copies of his research to the quarterback and his father but has not heard back. Nor were they available for Globe interviews. 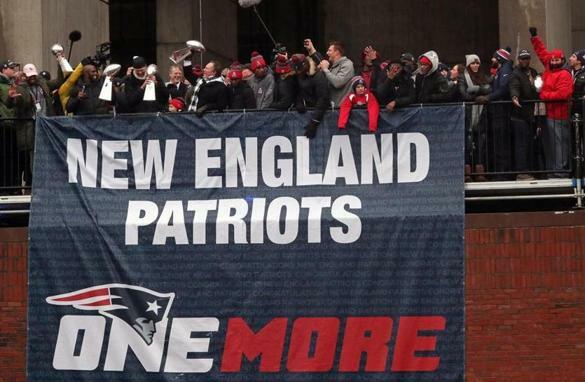 Brady made a rare reference to his heritage when the Patriots visited England in 2009. “I’m very proud of my Irish roots,’’ he told reporters. Tom Brady Sr.’s cousin, the Rev. Thomas Buckley, said in an interview that he has conducted his own research into the family’s genealogy. A retired theology professor who taught at Boston College, Loyola Marymount, and the University of California Berkeley, Buckley said he has reviewed McNiff’s work and found it credible. 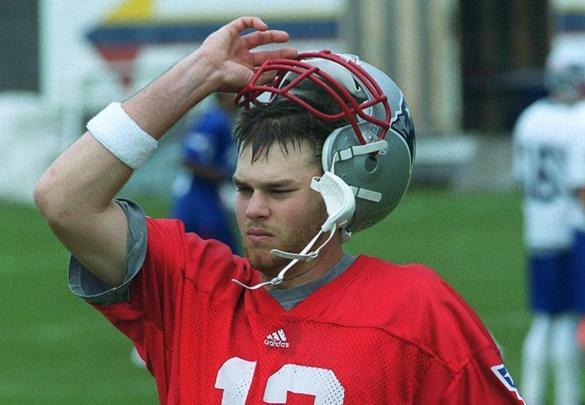 Tom Brady had never been to Boston before his rookie season with the Patriots in 2000. A native Californian, he owes roots there to John and Bridget Brady, who departed Boston for the Pacific Coast before the Civil War. Boston in the mid-1800s was inundated with Irish emigres. Details of Brady’s early American ancestors are scarce, but Irish immigrants in Boston during the mid-19th century generally lived in poverty, many in squalor, and were often treated as unwelcome intruders. Hordes of Boston’s new Irish had survived treacherous Atlantic crossings on packed vessels called coffin ships because so many died. Many contracted typhus on the ocean journey and cholera in their new city. They found work where they could, men generally as laborers on the wharves, women as servants in the homes of the privileged descendants of Boston’s early settlers. In the Civil War, thousands of America’s new Irish would be drafted by the Union Army. As McNiff documents, the young Bradys went west before the war with Bridget’s sister, Ann, and her husband, Lawrence Meegan, who also were Irish refugees. The Meegans lived on Porter Street in East Boston, and after Lawrence, a harness maker, was offered a job in San Francisco by a Boston businessman who had relocated there, the families set out for California. The story of their cross-country odysseys remains untold. But in San Francisco they found themselves in a booming frontier town thick with dreamers inspired by the 1849 Gold Rush and the discovery of silver in the Comstock Lode. In many cases, living conditions were more primitive than they were in Boston, but there was hope and opportunity and jobs, as Lawrence Meegan — and possibly John Brady — found with the Main and Winchester Saddlery Co.
Census records show the Bradys and Meegans settled next door to each other in San Francisco’s Mission District, then lived together after Lawrence and Bridget died in the mid-1860s. Their children almost certainly played together, which means Tom Brady’s great-grandfather, Philip, likely tossed a baseball with his cousin, Pete Meegan, who would reach the sport’s major leagues as the Brady clan’s first professional athlete. Tom Brady himself was a gifted baseball player, selected by the Montreal Expos in the 1995 draft before he opted for football. “Steady Pete’’ Meegan, as he was known in his heyday, pitched in 1885 for the Pittsburgh Alleghenys, who in 1891 became the modern-day Pirates. Meegan threw a menacing curveball, a pitch that once helped him silence “the world renowned Louisville Colonels,’’ ensuring “his name and fame were heard in every town that boasted a baseball team,’’ according to an account in the San Francisco Call. A year after Pete Meegan died, Tom Brady’s ancestors survived the 1906 San Francisco earthquake, which destroyed more than 80 percent of the city, killing 3,000 and touching off fires that raged for days. The quarterback’s great-grandfather, Philip F. Brady, was a San Francisco firefighter at the time. Classified as a hydrant man, he fought the conflagration though his firehouse had collapsed into rubble and the city’s hydrant lines had ruptured. His own home was almost certainly damaged in one of the country’s worst natural disasters. Philip F. Brady witnessed untold horrors in his 27 years with the San Francisco fire department. He also endured, as a parent, an unthinkable horror: the murder of his son, Philip J. Brady, Tom’s great-uncle. On New Year’s Day in 1922, Philip J. Brady accompanied three police officers responding to a complaint of an unruly lodger who had barricaded himself in an Oakland rooming house. When they entered the room, the resident opened fire, and Brady, who was covering the incident for a San Francisco paper, was fatally shot in the stomach. He was 34. Five journalists served as his pallbearers. “He died a hero to newspaper loyalty,’’ the Tribune reported. Philip J. Brady’s survivors included his younger brother Harry C. Brady, then 16. Harry one day would own a suburban San Francisco pharmacy, and on May 6, 1944, he and his wife, the former Peggy Buckley, had their fourth child, a son named Tom, who would become the quarterback’s father. Colonel Michael Buckley Jr. was a West Point graduate who lettered in baseball, boxing, and soccer. Tom Brady’s dad was a World War II baby whose family did not go untouched by the conflict. Less than three years before Tom Brady Sr. was born, his uncle, Michael Buckley Jr., fell captive to the Nazis. 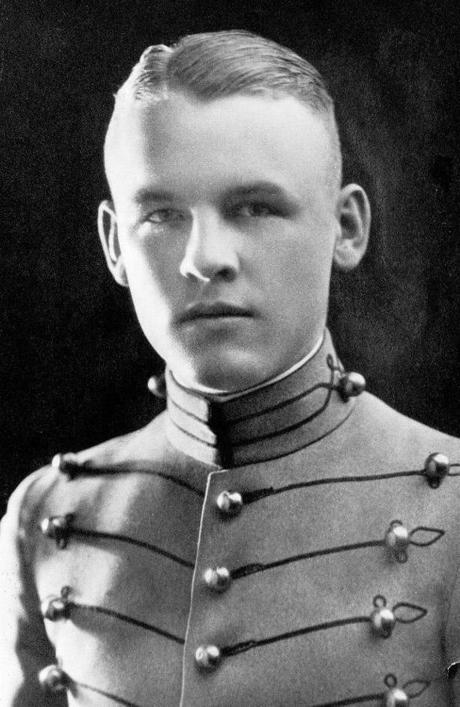 Buckley, a West Point graduate who lettered in baseball, boxing, and soccer, had been deployed by the Army to Egypt to serve as an observer with British forces fighting Germans and Italians under the command of Nazi General Erwin Rommel. On Nov. 23, 1941, two weeks before Japan bombed Pearl Harbor and the United States entered World War II, Buckley was observing South Africa’s Fifth Infantry Brigade when the South Africans were overrun by Rommel’s forces. Captured in battle, Buckley became America’s first POW of the war, according to his published obituary. He was held in Italy for six months before he was released in a prisoner exchange. He later served in Japan and, after the war, taught at Santa Clara University. For all his family’s devotion to the military — Colonel Michael Buckley Jr. was the oldest living West Point graduate when he died in 2006 at age 104 — two of his six children chose a different form of service, becoming priests. Tom Brady Sr. himself told the Globe in 2005 that he spent nearly seven years studying to become a Maryknoll priest. Then he changed course and joined the Marines, only to be discharged during the Vietnam War because of a knee injury. Back in San Francisco, Tom Brady Sr. was selling insurance when he met Galynn Johnson, a TWA flight attendant. She was two months younger, having been born on the Fourth of July, 1944, in tiny Browerville, Minn., a descendant of Swedes, Norwegians, and Germans who immigrated in the 1850s and ’60s. Galynn Johnson and Tom Brady married in 1969 and settled in the San Francisco suburb of San Mateo. They had three daughters before Tom Brady, their only son, was born on Aug. 3, 1977. Young Tom’s athletic prowess was not shocking, considering that all three of his sisters — Maureen, Julie, and Nancy — became collegiate athletes. Maureen was an All-American softball pitcher at Fresno State. For many years in Tom’s youth, the Bradys vacationed each summer in rural Minnesota, where Galynn’s father, Gordon Johnson, had been a barber before he saved enough to operate a small dairy farm. Galynn’s relatives recall fond memories of playing on the farm with the future Patriots quarterback. 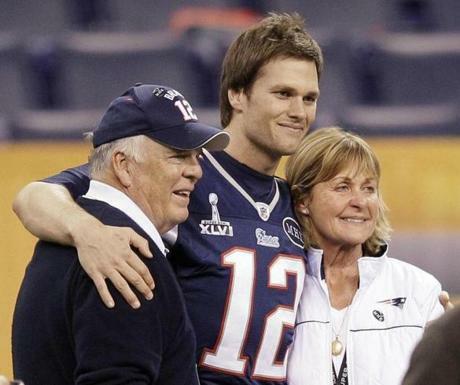 Tom Brady with his parents, Tom Sr. and Galynn, before Super Bowl XLVI in 2012. Tom Brady remains close to many of his relatives in California and Minnesota. He has invited them to his Super Bowl appearances, visited their homes, attended their special events, congratulated them when their babies have been born, grieved with them when their loved ones have died. When Galynn’s father died last year at age 97, Brady read a passage at his funeral in St. Joseph’s Catholic Church in Clarissa, Minn., a farm town of about 600. Then he invited some of his Minnesota relatives to a Patriots game and put them up at a luxury hotel in Boston. Brady’s parents still live in his childhood home in San Mateo, a short drive from Holy Cross Cemetery, where many of his ancestors are buried. Two headstones there are memorials to John and Bridget Brady, onetime Bostonians who helped give Tom Brady the gift of life.